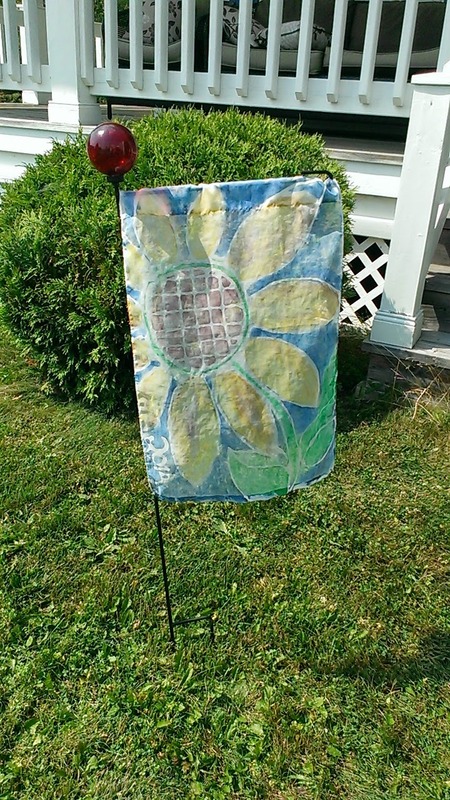 One of the activities we did last week at Grammie Camp was to paint Garden Flags. This is a picture of mine. I love sunflowers. I've tried without success to grow them at the cottage. So if you can't grow one.. draw one. We used a blue glue technique to draw our design on the lightweight sheer fabric. Then after the blue glue dried, we used water based acrylic paint to paint the different sections. The fabric under the dried blue glue lines will remain white. Then let it dry for a few hours and then wash to get all the glue and excess paint off. I happened to be at the drug store today, and they had garden flag holders on 30% off, so yippee for me. This little sunflower will hang in my little cottage garden for the rest of the summer. 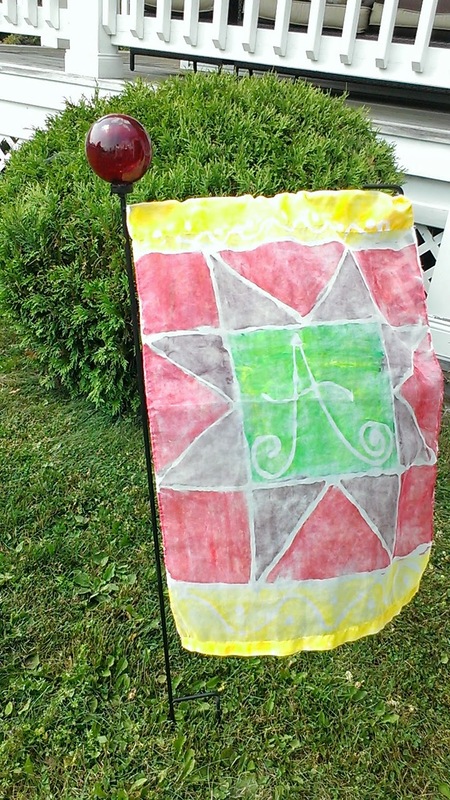 I had an extra blank flag prepared so I made it into a quilty style flag to hang at the church. It will be used when the hand quilters are there doing their craft. The first quilter in hangs out the flag. That way, less mobile quilters will know somebody is in and they won't make the trip up the long staircase to a locked door, only having to turn around and take the long way in to unlock the door. I think this is just darling. See the cute "A" I drew for St. Anthony's Church. The garden flags drying on the line. I'm back and have had two days to rest from Grammie Camp 2014. We had an awesome Grammie Camp this year. I can't thank my sister, Donna and brother in law, Terry enough for helping me do the five Grammie camps. My sister organized "Minute-to-Win-it" games, that the kids love, and she did so much research with me on various crafts that would be good. She entertained the kids with her amazingly funny accents which was modeled after some of my dear old Aunts! While he has made many contraptions for Grammie Camp, this year was the first year for my brother-in-law Terry to actually come. He made and brought a wildly fun dunk tank; did a GPS scavenger hunt for the girls which had them peddle boating out to a dock to get a clue, and he did lots of prototype testing of the stick bomb. And a big thank you to my hubby and Grampie to all these kids, for all his help in organizing food and supplies logistics, cooking, cleaning, being a fair (or unfair) judge in the games. To see and hear these kids laughing, and screaming as they are doing the activities, is just heart warming. I wish you all could have been there. My Facebook friends got a glimpse since my sister did an amazing job updating facebook every day!! Thanks so much from the bottom of my heart, Donna Terry and Grampie. If you had power last week, you probably saw that I had a good opportunity to work on my Christmas in July project last week. I had this kit ready to work on after Grammie Camp which is Scheduled for this week. If you are a confident knitter you might enjoy this small project. I found it helped me pass some time last week while feeling captive by the No Power situation. This is a free pattern that is offered on the simplicity website here. Give it a try, I'm sure you will love it..
Now I'm full steam ahead on Grammie Camp activities. Our lakeside program starts tomorrow. I'll be back in a week! We have Power - What a Relief! It was evident at 5 pm last evening that something was happening. Big power trucks rolled in on our street. People were out on their lawns excited. We have been waiting for this for a whole week. By 8 pm we had lights. I can't tell you how elated we were. What an experience! Ahh, now to get back to normal. Power or No Power, I need to find ways to do final preparations for Grammie Camp, which is scheduled for next week. I still have a few hours of sewing to do, and baking of cinnamon bread and cookies etc, for snacks. Most places around us have power. I hope we will get ours back today. I thought that yesterday, but I can't wait any more. 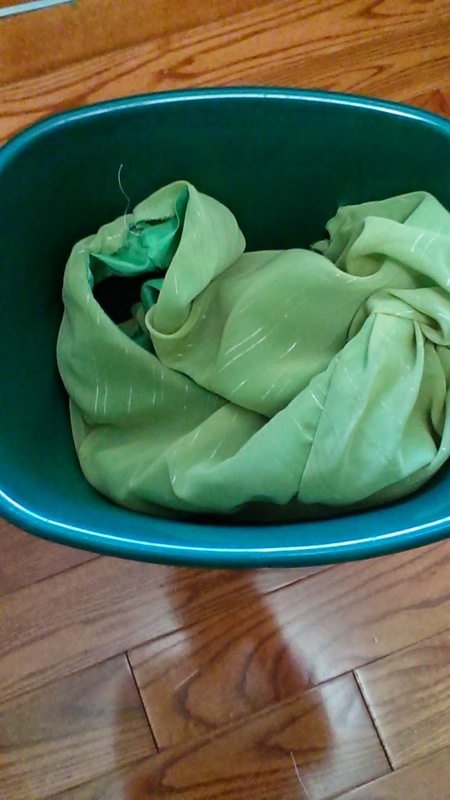 My plan for the morning is to take my sewing machine out to a friends house to sew. Before I go, I'll prepare a cinnamon bread to bake while I sew. If I get those two things done this morning, I'll feel like I'm making progress. Meanwhile, my Christmas in July knitting project is coming along. I now have 6 of the nosegay pattern repeats done and moving on to the next stage of this project. No more bobbles to knit..yippee. 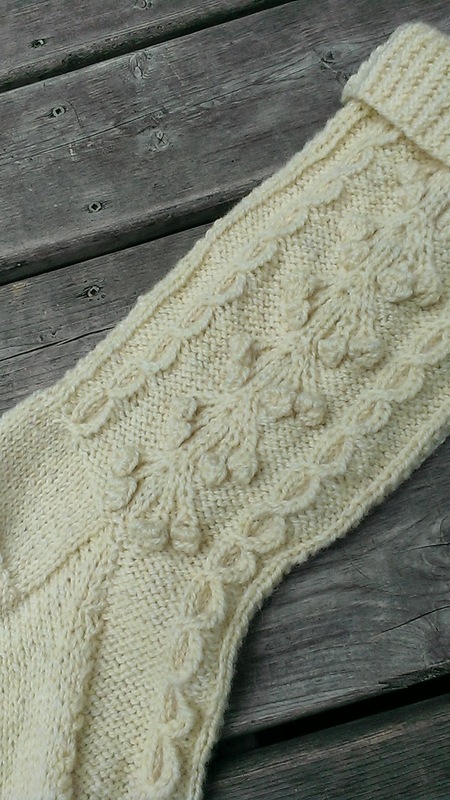 I'm now into the second skein of yarn, and the next part of the pattern will see this project take on a new shape. I'll show you when I'm done... probably after Grammie Camp. I've been totally distracted by the power situation. (into day 5 by the way). I carry my iPod and listen to the radio on my daily walks. 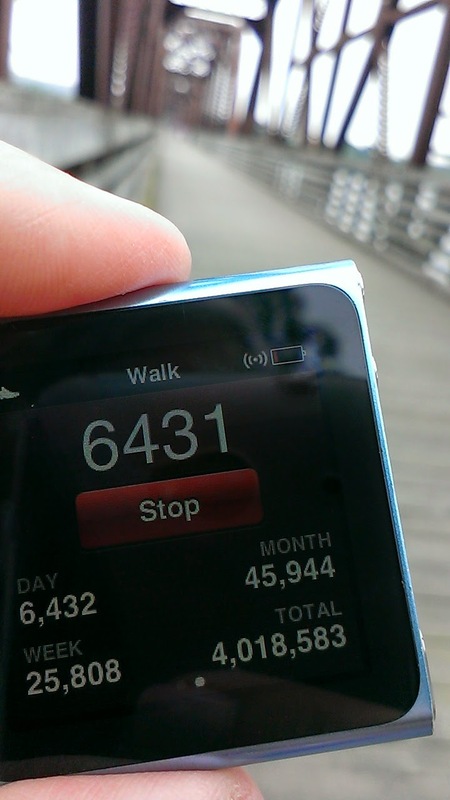 The iPod counts my steps automatically and I look at the step count occasionally. A couple of weeks ago, I knew I was approaching 4 Million steps. But totally forgot about it over the last week. It would have been a couple of days ago that I missed my 4 Million step milestone. I thought of it this morning and snapped a picture on the walking bridge. Yippee. I love a milestone. No Power - Still Knitting! We are into Day 4 of no power. Many people have their power back and we are glad for them. 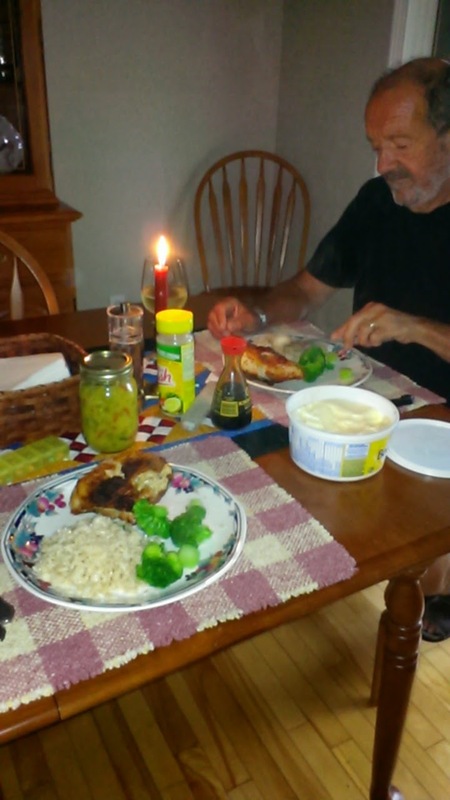 Friends who live handy got their power yesterday, so they invited us for supper. So nice. And the other good news is that most stores have power now, and are open normal hours. Gas is readily available now, but ice and propane are still a in demand. Lineups are long. 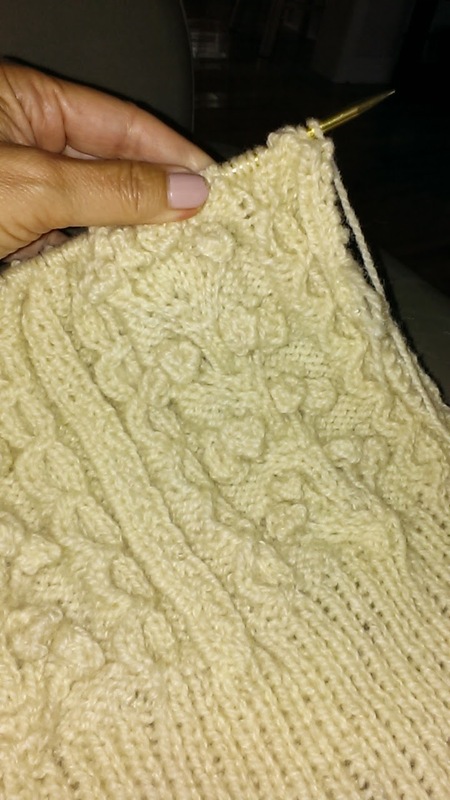 Yesterday, I finished knitting another 10 rows of my Christmas in July project. 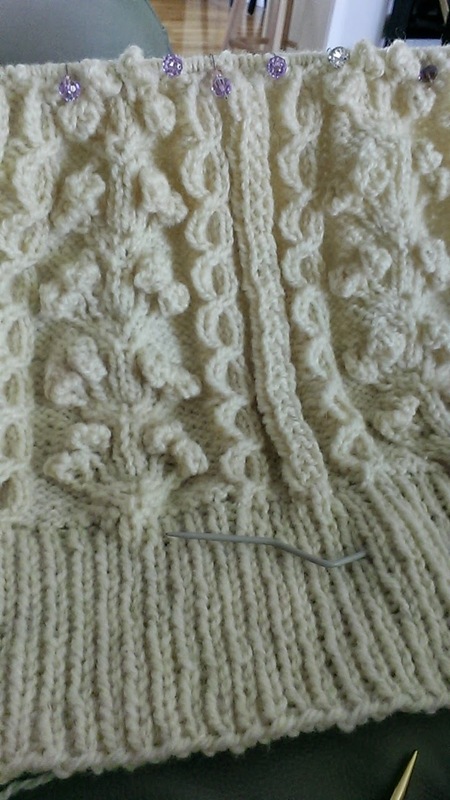 Each nosegay (with the bobbles) has 10 rows to complete the pattern. So for me it's a good goal. Will work on 10 more this afternoon. Do you see my cute stitch markers. I use them to separate the rows of the cables etc. In this project, there is a total of 85 rows and I now have 50 done. I've been doing 10 rows a day. It's very complicated and slow going. But I like it because it's a distraction. I was in a sweet knitting store called Cricket Cove in Blacks Harbour the other day. We were on our way home from visiting the Grand Manan Quilt Show. Being in the store reminded me that I was supposed to make my daughter and her knitter friends some stitch markers. She is taking knitting classes and is throwing around words like yarn overs and stitch markers. It makes me smile, but really she has no idea what to do with stitch markers... teehee. 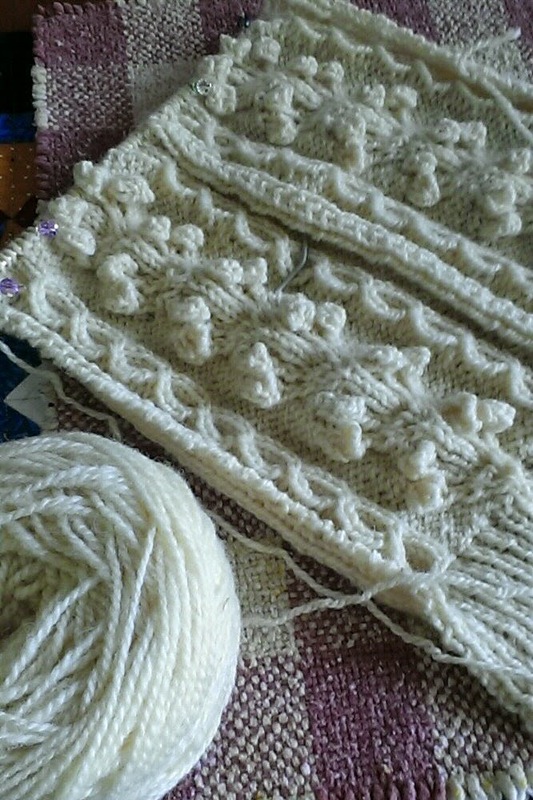 Now, this afternoon, I might knit 10 rows on my Christmas in July project. 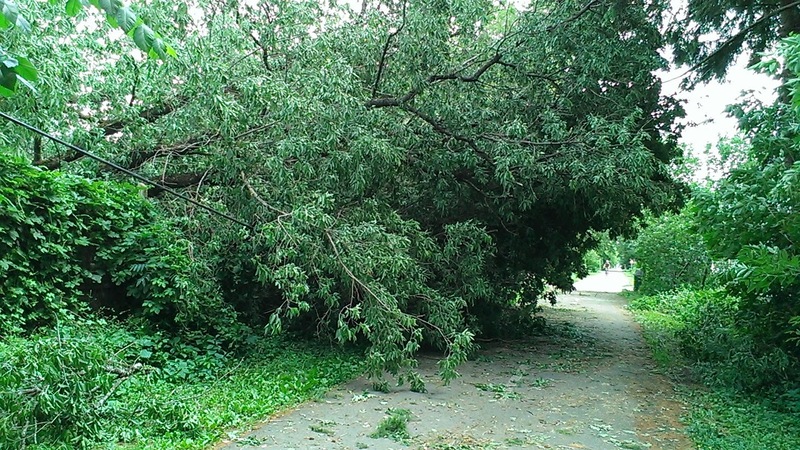 Tropical Storm Arthur came out of nowhere. It seems like forever that we've had no power thanks to tropical storm Arthur. But it's only been 48 hours. We may get it back later today or tomorrow. We realize how dependent on electricity we are and we are truly thankful for all the power crews working so hard to get things going again. We are making do and are lucky to have a small generator to keep the fridge and freezer going. 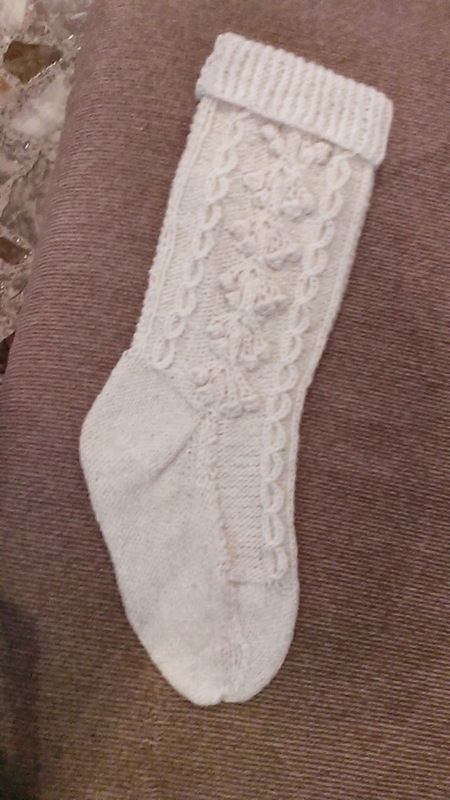 Can't sew, but I can knit without power. This is my Christmas in July project. Stay tuned. It might be done sooner than I thought. I give up!! Dressmaking is not for me. Last week I had the notion that I could sew myself the perfect fitted dress. See next month, I'm going to be the Mother of the Bride. My daughter is getting married... I need a nice well fitting dress for the pictures more than anything. I carefully selected a pattern and bought practice fabric and lining to make the dress... My intent was that if it worked out, I'd shop for nicer fabric and make a good one. It was a little complicated but I don't usually mind complicated. I have spent hours on cutting it out, pinning, marking, basting, sewing and finally I have the bodice done. My friend's small dog "Peanut" is turning one today. We are going to their house to watch fireworks over the river this evening. 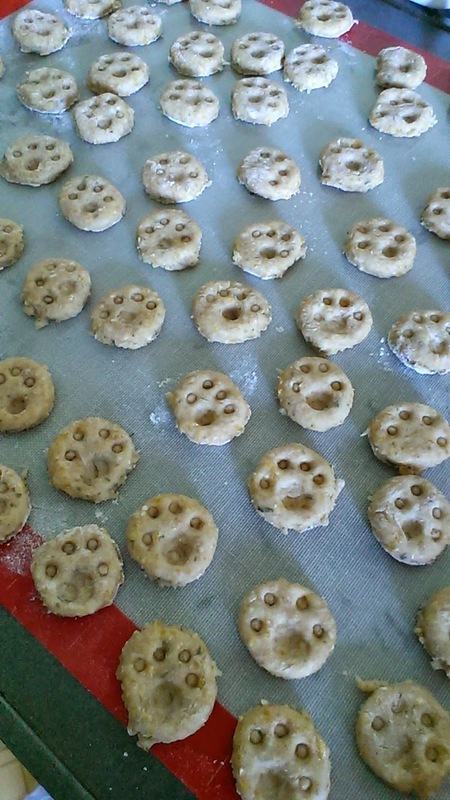 So I decided to make some happy birthday dog treats for little Peanut. It's hot out here today so I only cooked one cookie sheet full. I saved the rest of the dough and will make them when the kiddos come for a visit next week. They can take them home to their dogs. These are very small cookies. I looked all over my kitchen for a small round cookie cutter. I ended up using the larger end of a large cake decorating tip. 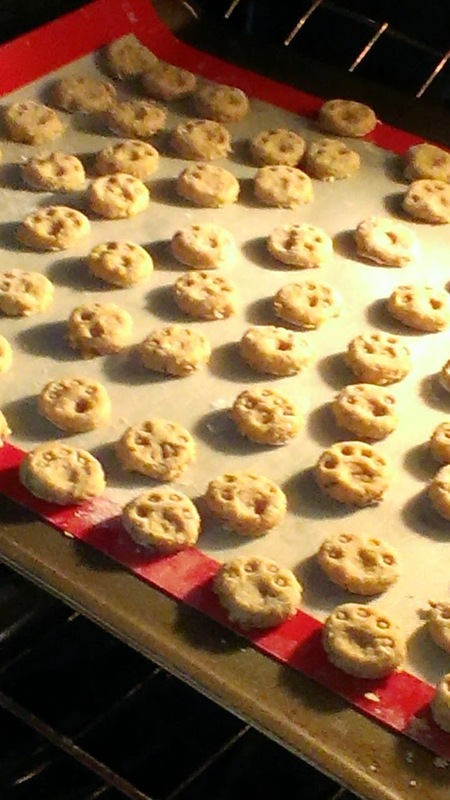 Then put little paw prints on the cookies. So cute, don't you think? 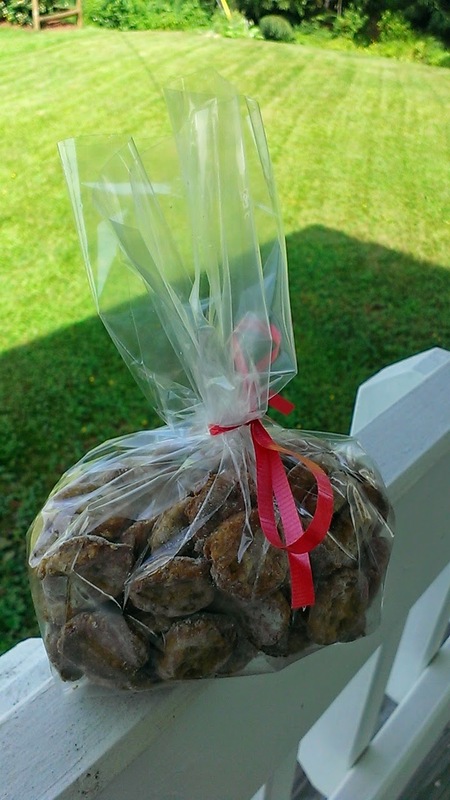 I've packaged them up in a cellophane bag with a little red bow for her Canada Day Birthday. I hope little "Peanut" likes them.